These replace the strum and whammy bar from a standard guitar, allowing you to use a single hand for the chords. What you do is use your foot and click your toes up or down to strum or navigate menus. To perform a whammy you lift up your heel – the spring loaded plate is shown in the up (full whammy) position in the photo, but normally your heel compresses it (no whammy). 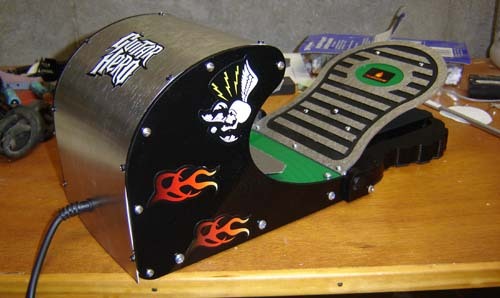 The pedal plugs into a modified Guitar Hero 3 Les Paul wireless controller. You can still strum the modified guitar but the whammy is only on the pedal. For more photos and info check the rest of the story below. This project also finally gave me an excuse to throw together a “music video” demonstrating its use, check it out here. 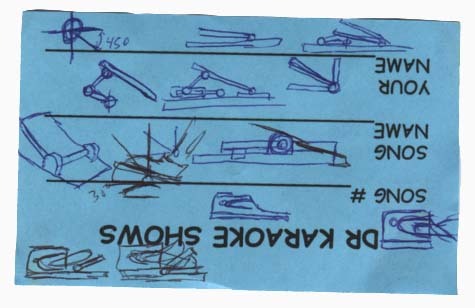 I first started with a wooden prototype… it’s really quite simple but I guess it’s the though that counts. I then modified the wooden prototype with a flimsy heel pedal, as shown above with one of my Sperries. One of the trickiest parts of this projects was figuring out the correct range of rotation for the whammy potentiometer. This then has to fit the range of a spring, and yet be within the range of lifting ones heel. A shot of me playing GH3. And yes, I do still have an Atari 2600 hooked up to my TV – why wouldn’t I? Myself with the pedal and guitar. 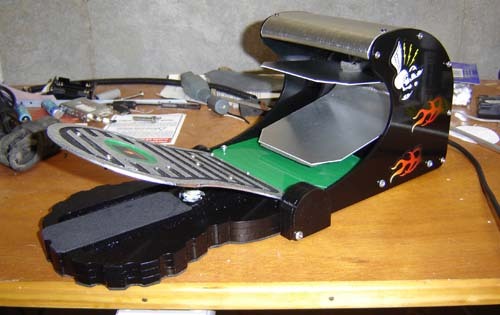 The pedal kind of resembles a big metal shoe, kind of like if Robocop went to Holland. Click for larger version, suitable for use in press releases and/or print without having to email me asking for larger pics. Using the stickers included with the guitars really tied the look together, wouldn’t you agree? Very cool. Also, the video was very nice work with the splicing of your films in and stuff. Worked well. The flame stickers really add a touch of class. Everytime I come to this site I find something awesome to make me smile and think I can still be a gamer 🙂 Thanks Ben! I hope these get manufactured one day! Very nice work! This plugs into the guitar itself? I love that all-metal build. It looks like it belongs on-stage at a concert. That attention to detail is great! Pingback: Guitar Hero… with your feet? « XSp. Pingback: Guitar Hero… com os pés? « XSp. This is awesome, will gamers with one hand be able to get these somehow? 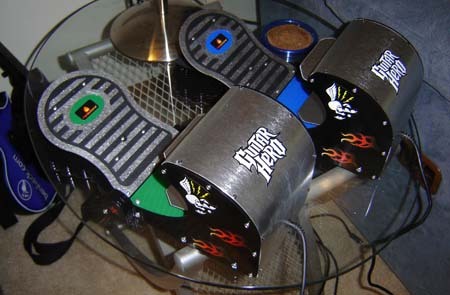 You should really go into business selling some of your creations, you would make a killing because there is plenty of money to be made in Guitar hero and Rock Band related products. As for this specific idea, there may not be a huge population of one-handed gamers, but plenty of people would love to have something like an effects pedal that sets off overdrive / star power. They’ve got something like that available. I saw them on e-Bay before. I can’t remember how expensive they are, though. 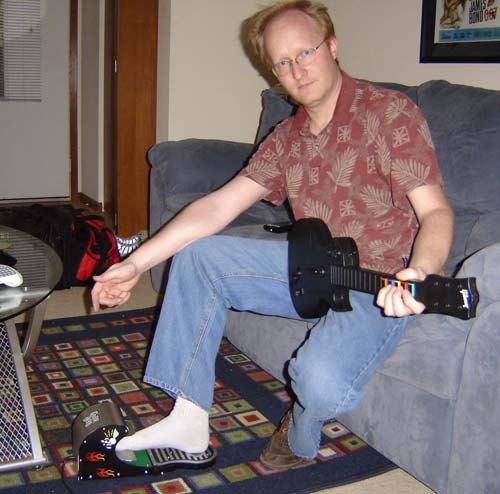 Pingback: Ben Heck maintains his reputation with Guitar Hero pedal controllers | Hyper Tech Ninja: Freeware and Technology For All! Where can we get one? One of the kids I work with has a left hemiplegia; and is a Wii fanatic. 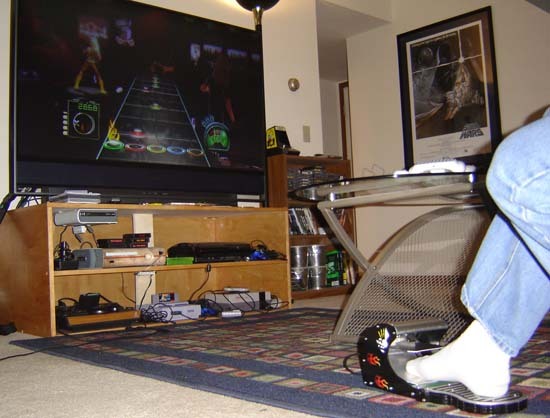 He plays Guitar Hero, but only with one hand, which plays havoc on his scores. That was a great video. Looks like I gotta see your movies now so I know where some of those clips came from. WoW amazing!!! I really need one of this! I´ve lost my right arm on an traffic crash and I love to play guitar hero. Cool man. I even never think about this before. How long you make this one? Very cool. My daughter was born with only one arm and she is frustrated by games like GH that her brother and friends can play. Guess I have a new project to replicate your work. Thanks for the inspiration! I lost my left arm in a farming accident and get to watch my wife and kids play GH all the time, they love it! I would love to be able to play rather than sit frustrated on the sidelines! Are these going to be available anywhere? Does someone know when Wheelman for Xbox360 will be released? I am a one-handed gamer for now hopefully I’ll regain movement in my left hand eventually. This is awesome I was thinking of something similar to this while I was at rehab after my accident last year. Where can I get it or detailed instructions with a materials list to build one for myself? Rock on!!! Pingback: Kwanzoo - Social Inbound Marketing » Video Games: A short talk with Ben Heck. Pingback: Insanely Modded Game Console Controllers! « Coregamer – Games news, reviews and discussion- your difinitive news source.